The art period known as Romanticism lasted from approximately AD 1777-1850. The goal of the artist was to present a romanticized vision of life. 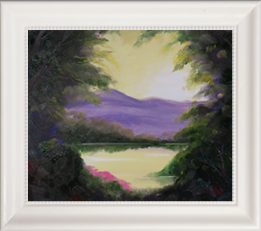 In this project Sharon will teach students how to paint in the Romantic style. Enchanted Valley is an oil painting. It is not a difficult project as it is a Level 1. However, parents will want to be present with younger students because they are painting with oil based paints. It can be messy to use and hard to get out of carpet and clothing. It might take a Cleaning Fluid or Turpentine to get it out.